Two years ago our dog Maxx of ten years got very ill just after he had fully recovered from a surgery that removed a cancerous tumor. Our vet told us that this was it and that it was only a matter of time that our boy would pass away, there is nothing I could do for him, we were told. Well we were absolutely not going to give up on our loving companion of ten years so easily. My feeling was that this vet had an agenda with us because of a complaint I had recently expressed about one of his employees that hurt Maxx by incorrectly trying to lift him. Shortly thereafter disappointed and heart broken we took our boy home, we putting him down was not an option. He is family and we would not give up on him so easily, especially when we could see so much life and love in his sparkling eyes. My huband and I started researching on the internet for alternative medicine for dogs. Fortunately, we found medicinal options that we felt would safely help Maxx get started on his way to getting well again. Many of these medicines we read about were holistic and although we live in a big metropolitan area, some were not locally available. However, we were fortunate to find that some of the holistic medicines we needed for Maxx were sold on-line, while several others were available in stores a short distance away. Over a short time of giving Maxx these holistic medicines, his health began to steadily improve. Although Maxx's overall health steadily improved, he still suffered from arthritis in the joint of his right front paw, which occasionally caused him to limp. In addition to the holistic medicines we also found a great animal rehabilitation center fully equipped with top notch equipment with a holistic approach to the rehabilitation of animals. 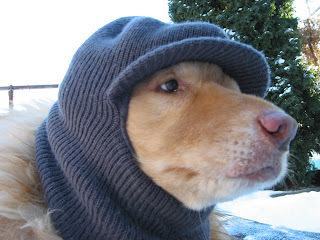 We also learned it provided acupuncture for pets. It had a underwater treadmill which Maxx could use to rehab his rear legs, we could also get his acupuncture treatments at the same time. The staff was great, and made us feel right at home. The veterinarians had vast experience in animal rehabilitation as well as being well versed in Chinese and Western herbs. After a few months of taking Maxx to the clinic we were able to arrange for Maxx to receive his acupuncture treatments at home twice a month. We are so happy to say that these holistic medicines have turned our boy Maxx's health completely around and we recently celebrated his twelfth birthday! The holistic approach has let us enjoy Maxx for two more wonderful years and counting. Just like humans always get a second opinion if in doubt. Maxxamillion enjoying the snow in our back yard. 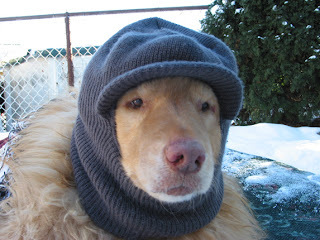 The temperature was -0 so he had his warm hat on to keep the cold air out of his ears. He had an infection in his right ear last week.